Heavy rains and high winds covered most of the state keeping bees in boxes all day Thursday. Rain accumulations ranged from .25” in the southern region to over 1” in Chico, accompanied by high winds throughout the day. Petal fall greatly increased in all regions because of the weather. 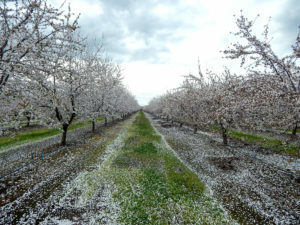 Nonpareil, Monterey, and California type pollinizers had over 10% of viable flowers lose petals on Thursday. 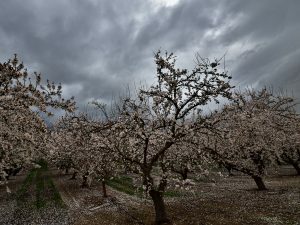 The only area in the state without rain and high winds was Kern County in the southern-most growing region. Consequently, it was the only area to get any significant bee activity yesterday with 5 solid hours of flying. The rest of the state had no significant bee hours. Wednesday, however, saw the central and southern regions with mostly sunny skies and daytime highs over 60 with calm winds. Bees averaged between 3 and 5 hours in both regions. In the northern region high winds on Wednesday limited bee hours to only a couple of poor hours of activity. 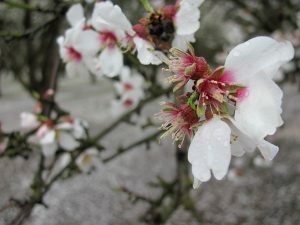 The warmer weather spurred the remaining bloom in Butte and Padre varieties in the southern and central regions. Peak Butte bloom was achieved on Wednesday in the central region and should be seen in Padre over the weekend. In the southern region both Butte and Padre have well over 50% open flowers. Applications of fungicides for bloom diseases were completed Wednesday ahead of the rain. 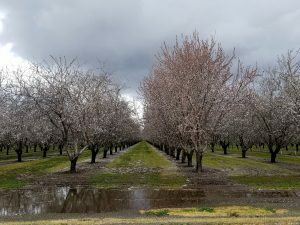 Wet weather on Thursday prevented growers from getting in their orchards. With the threat of more frigid morning temperatures on the horizon, growers will continue to monitor temperatures and are still prepared to frost protect if necessary. Wind: 15 mph. Gusts up to 45 mph. Rain: .5 to 1.5″ throughout the day. Wind: 6 mph. Gusts up to 20 mph. Rain: .6 to 1″ throughout the day. Wind: 7 mph. Gusts up to 22 mph. Rain: .2 to .5″ throughout the day. Sky Conditions: Dense clouds in the northern region. High, thin clouds in Kern and Tulare counties. Bee Activity: 0 hours in the northern part of the region. 5 good hours in Kern and Tulare counties.